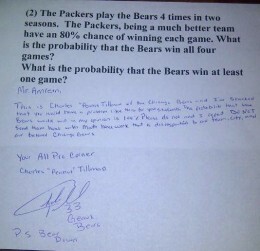 Apparently one of Mr. Amrein’s students is a cheater and sought out Bears Cornerback Charles Tillman for some help. Tillman’s response…Hilariousness. This is Charles “Peanut” Tillman of the Chicago Bears and I’m shocked that you would have a problem like this for your students. The probability that the Bears would win in my opinion is 100%. Please do not and I repeat DO NOT send them home with math homework that is disrespectful to our team, city and our beloved Chicago Bears. Props to Tillman for being funny and appropriate. I’m sure lighting up this nobody with a bunch of F bombs was the first thing that crossed his mind, but he kept it PG and still put him in his place. Love it. And as far as I’m concerned, as long as Jay Cutler is running the Bears, this probability will hold true. Loser. This entry was posted in Events, Football, News, NFL, Sports and tagged Bear Down, Charles Tillman, Chicago Bears, Mr. Amrein. Bookmark the permalink.